Summary: What begins as Constable Dallin Brayden escorting the prisoner Wilfred Calder back to Putnam quickly turns into a flight for both their lives. Political betrayal and malicious magic lurk behind every bush and boulder in their flight across the countryside, resulting in Dallin becoming more protector than gaoler, and fostering a growing connection between him and his charge. Haunted by dreams not his own and pursued by just about everyone, Dallin begins to understand that he’s not just protecting Wil out of duty anymore. As the shadow of Wil’s previous life as a captive and tool continues to loom, the shadow of the man who kept him prisoner looms larger. Forced into a terrifying battle of both will and magic for not only his life, but his soul, Wil discovers that the Aisling is sought by more powerful enemies than the Guild and the Brethren: ancient gods and soul-eating spirits seek what lives inside him as well. And it seems his only salvation may well be Dallin and his goddess, the Mother, against whom Wil has been warned all his life. It's been worth the wait – the second installment of Carole Cummings' Aisling trilogy is out, at last. I've been going nuts waiting to find out what's happened to Wil and Dallin since I finished Part 1: Guardian. That was a 5 marble read here. Part Two: Dream is every bit as good. This is definitely a continuation of the story – the narrative picks up where it left off, and you'll be confused for a while without the advantage (pleasure) of reading Guardian. Wil and Dallin have reached a place of tenuous safety and have a breath or two to assess what they have been through, but hardly more than that, and then dangers start again. Since Wil and Dallin are coming only slowly to an understanding of one another, small things could escalate to grave danger with no trouble at all. A few secondary characters come to add to this, and the sick edge of distrust taints every small advance to truth. Dream is a book of reversals – what was a flight and pursuit becomes a pilgrimage of sorts, what were enemies become something both more and less than friends and lovers, fear becomes trust, and yes, trust does become doubt. By the end of the book, very little is as it started, and the changes are perfectly plotted and in character. Dallin and Wil themselves come to a better accord and a somewhat better understanding – this is an evolving relationship. They do come together sexually in a scene that is a brilliant "fuzz to dark gray" that manages to be one of the all time sexiest scenes I've ever read. Of course, after that, Wil needs a good sharp slap, but rethinks things before I can give it to him. Love Wil, poor scarred man/boy who holds keys he doesn't understand. Love Dallin, too, and want Wil to find the wholeness to love him as much as I do, and yet... this adventure is not over. The language is at turns poignant and pointed – we yearn for Wil to see a river as much as Dallin yearns to show it to him, and somehow a river becomes a wider world much safer than any they've lived in so far. Simple actions and wishes become astonishing in her descriptions – the words are the words of English but the stringing together is – magic. I have and loved both books. 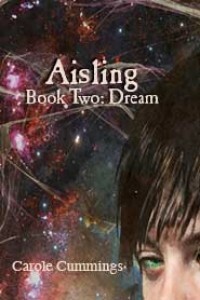 In fact, unwilling to wait for my print version of Aisling 2, I also bought it as an ebook.